Deserving students who are enrolled in Philippine private Higher Education Institutions (HEIs) will also benefit under Republic Act 10931 or the “Universal Access to Quality Tertiary Education Act” through the Tertiary Education Subsidy (TES) Program. 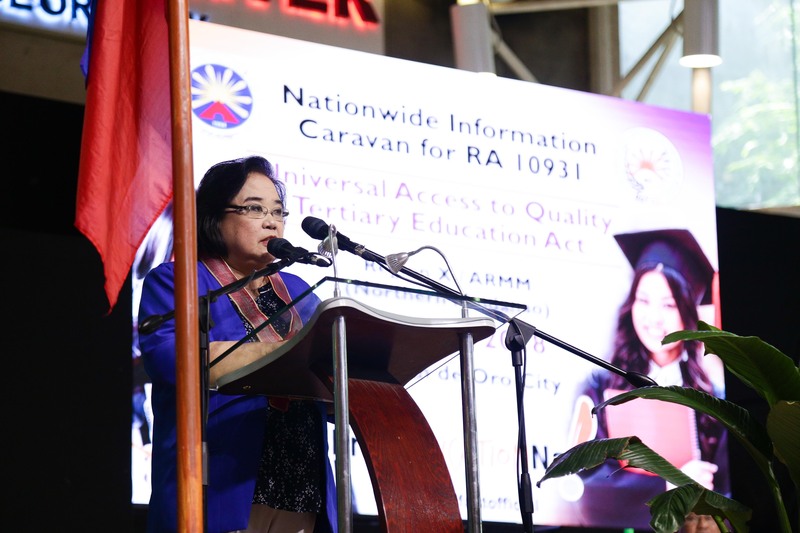 TES is a program under the landmark legislation, was highlighted last April 18 during the Northern Mindanao / ARMM leg of the Nationwide Information Caravan on R.A. 10931 at the Limketkai Center in Cagayan de Oro City. UniFAST Governing Board Member, Coordinating Council of Private Educational Associations of the Philippines (COCOPEA) President, and Pilgrim Christian College President Dr. Pio Baconga emphasized that the law is not just for students in State Universities and Colleges (SUCs) and Local Universities and Colleges (LUCs). “Providing quality education is the duty of the government. The Implementing Rules and Regulations (of the law) recognizes the complimentary roles of public and private institutions. The TES is where the private institutions can come in,” Baconga said. COCOPEA is composed of five private educational associations: Catholic Educational Association of the Philippines (CEAP), Association of Christian Schools, Colleges and Universities (ACSCU), Philippine Association of Colleges and Universities (PACU), Philippine Association of Private Schools, Colleges and Universities (PAPSCU), and Technical Vocational Schools Association of the Philippines (TEVSAPHIL). UniFAST Secretariat Officer-in-Charge Executive Director Atty. Carmelita Yadao-Sison further discussed the TES program, which prioritizes support to students from the poorest of the poor households. “TES program will prioritize students who are existing beneficiaries of the CHED Expanded Student Grants-in-Aid Program for Poverty Alleviation (ESGP-PA), and students considered as poor based on the National Household Targeting System or Listahanan 2.0,” Yadao-Sison said. The TES prioritization system shall not apply to Filipino students in cities and municipalities with no existing SUCs or CHED-recognized LUCs. Based on UniFAST’s estimate, at least 1.2 million students are potential eligible TES beneficiaries just among 16-22 years old high school graduate students without tertiary degree belonging to Pantawid Pamilyang Pilipino Program (4Ps) households, this coming academic year. Inquire at your Regional CHED Office. Goodmorning maam/sir…I lately knew the result and my name wasn’t there in the lists of grantees… I just wanna know how did they come up with a result. Please call or go to the office directly. Kung saan kayo nagfile.